Sometimes when new jersey cuts and templates come out, I look at what we got and wonder.... what if team A used team B's jerseys? Well, here we go. I'll be posting a couple jersey swaps. These won't be full identity swaps, as you'll notice there will be some small details that were left the same/omitted. There's no weird reason i have for choosing which teams I'm pulling from, and i'm not swapping both teams with each other, just one team using another team's jersey. So far I only have a few ideas so if anyone wants to see/suggest others, please feel free. 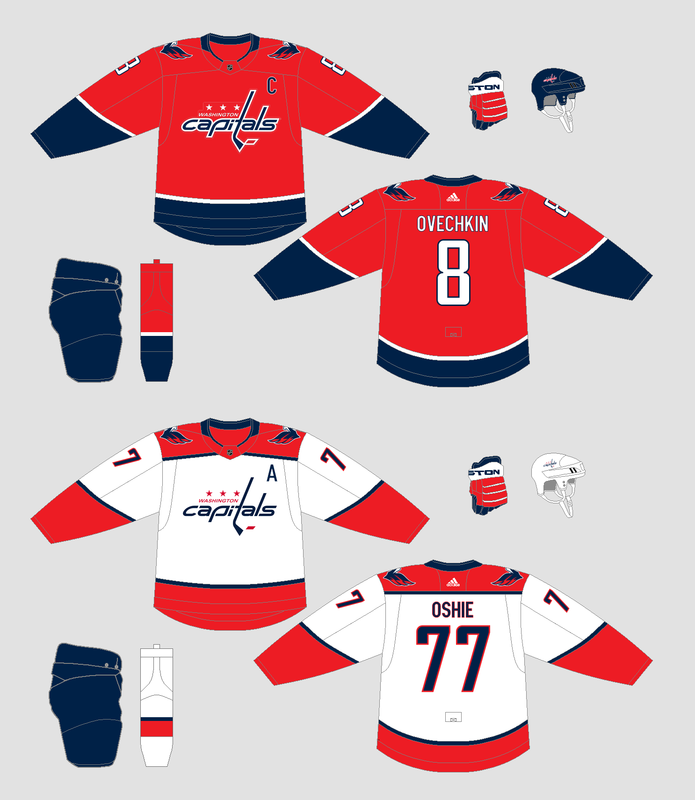 First up is the Washington Capitals borrowing the Nashville Predators jerseys. That looks so much better with the Caps colour scheme. 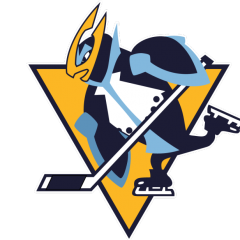 I sat down and came up with more teams to work on than I originally thought I'd do, so I think I might try for the whole league. Next up is Nashville. 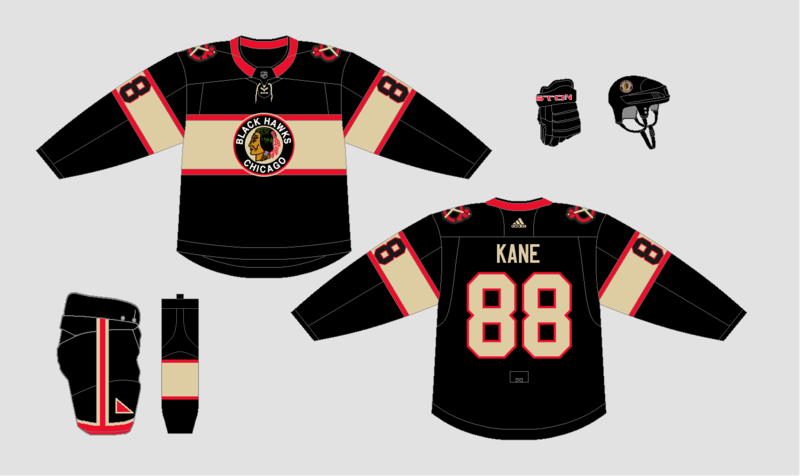 I saw a lot of easy connections to both their current jersey and the previous one in using the Minnesota Wild's new home jersey. Hope you like. hmph. I had trouble with it finding the right shade. Before it looked too dark. but thanks. I found the color, but on my monitor at least it just looks so dark and not right. How is this though? 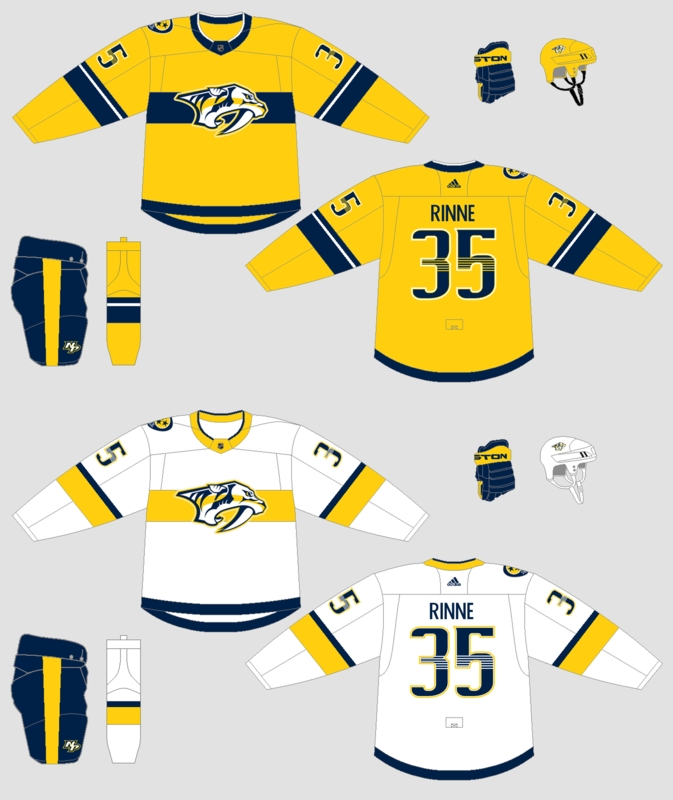 Now that’s a spicy Nashville jersey swap! 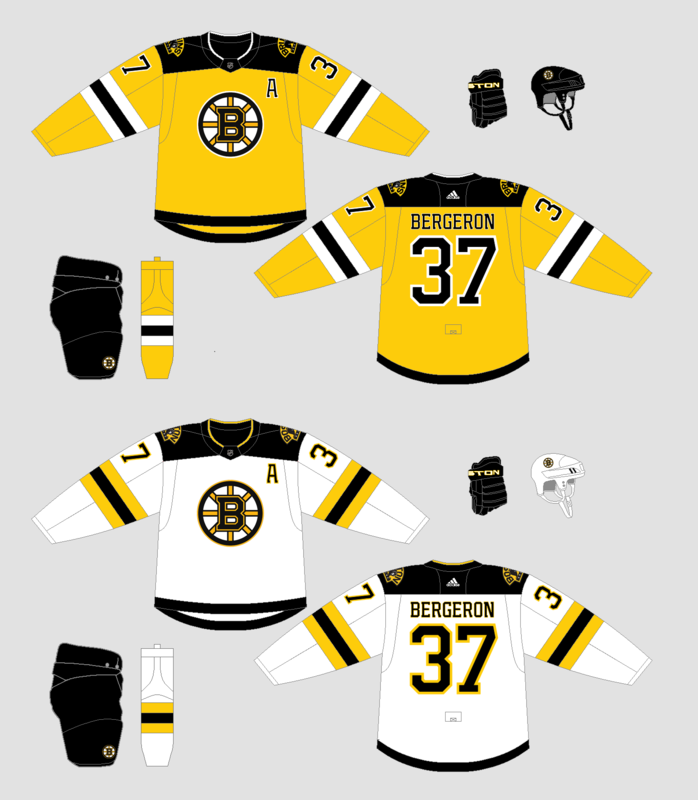 Here is my next one: Boston Bruins using New Jersey's new jerseys (meant to do that). I have another idea for Boston as well, so may end up with a bonus set later on. 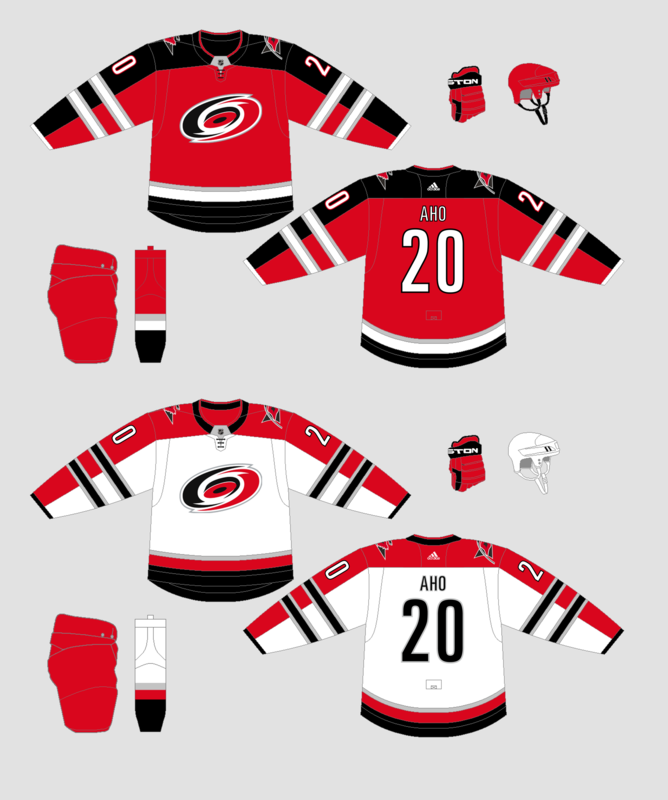 Next up is the Carolina Hurricanes using the Winnipeg Jets jerseys. I liked this one as I was able to blend elements form all of Carolina's jerseys into this, and thought it came out well. The hem stripes match their old arm stripes up until their second Edge set, and the arm stripes on the road carry on the silver and black matching the numbers from their current road. I know it will be said, but I tried sublimating the warning flag design but it looked good on the red stripe on the road, but not as good on the white stripe on the home. I actually have a few ideas for them, so I'm trying to narrow down which one I do. I want to do my best to avoid re-using the same teams as much as possible, even though there are some that would work well for a number of teams. Is this dead? Please continue it was great! Thanks, not dead. Ran into a wall of what team to do next and then time issues. I have a couple of alternate uniforms though! Here is Chicago, throwing back to a previous, using the Florida Panthers' jersey. Here's a new one. Started out using this for a different team, but it wasn't working, so I went this way. 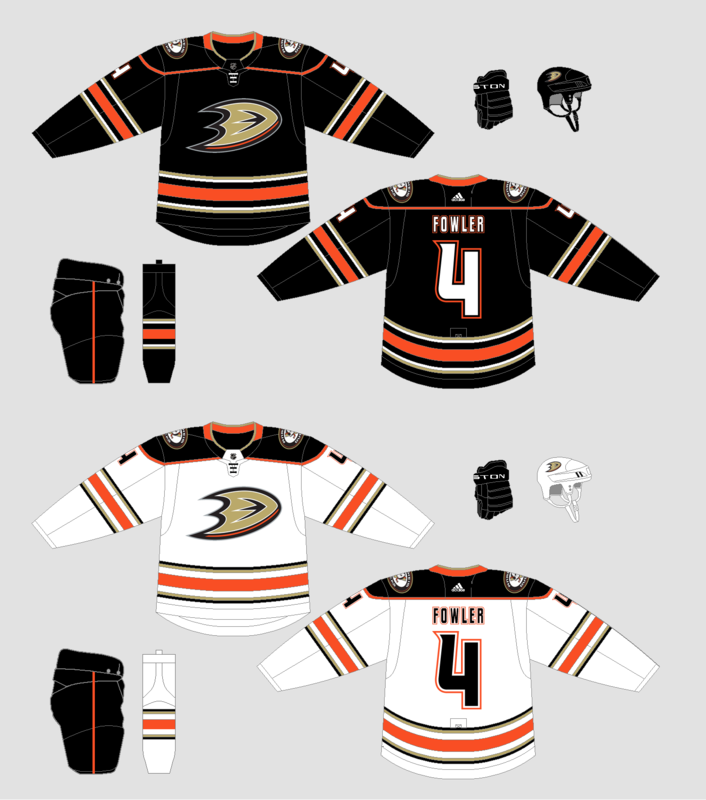 Ducks using Sabres' set. I'll have to agree with a statement said earlier, all of these swaps are better than what the teams are wearing right now, especially the Hawks. that's a beaut. Here's one that might mess with your head a little. 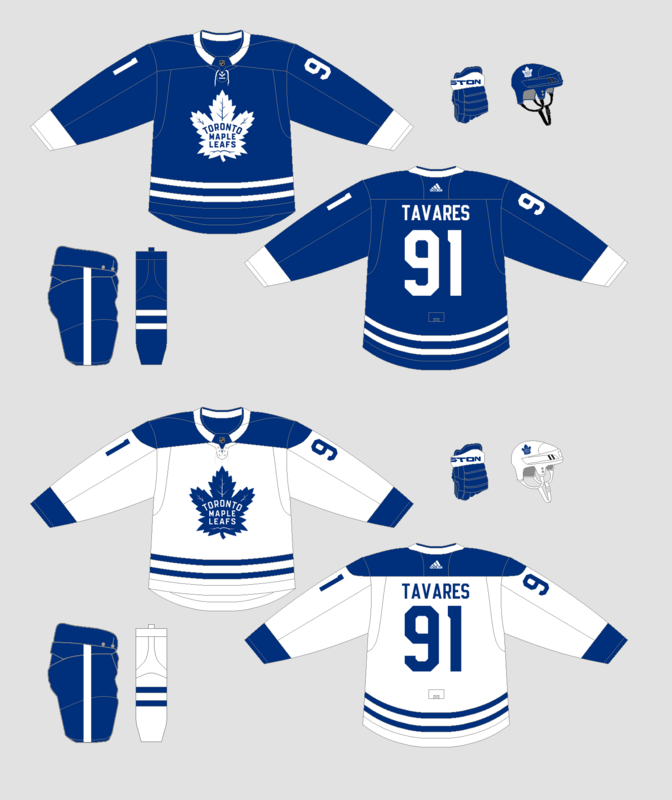 Toronto Maple Leafs using the Montreal Canadiens' road jersey. If you think about it, it's a lot like the redesign they just had, just flipping the styles of the arm and hem stripes.